I have often heard people criticize Breslov Chassidus because they perceive it to have an overemphasis on the concept of shemiras habris. Given the fact that this concept pertains to overcoming one of a person's strongest and most powerful desires, would you attribute the criticism of shemiras habris to a critic's conscious or unconscious realization that they have great difficulties living up to the ideal? To what do you attribute Western society's derision of shemiras habris in general? What is their (extremely bad midos') treatment? Chachamim will teach one who is very angry to conduct himself [in such a way that] if he is struck or cursed, that he will not feel anything at all and to go in this way for a long time until the anger is uprooted from his heart. And if he is arrogant, he should conduct himself in an exceedingly degraded way and dwell in a way that is below everyone. He should dress in worn clothing and [wear things that] humiliate those who wear them. And he he should do other things along these same lines until his arrogance is uprooted from him. And then he should return to the middle path, which is the good path. And when he returns to the middle path, he should walk in that way for the rest of his life. Perhaps Breslov Chassidus recognizes that shmiras habris is most people's greatest area of weakness and therefore encourages them to constantly go to the extreme to continually correct this aspect of themselves. 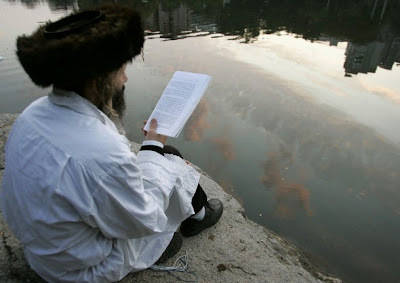 You asked whether some critics of Breslov deride their extreme emphasis on shmiras habris because they know, consciously or subconsciously, that they themselves are deficient in that area. There is something to be said for that. As Shmuel says in the Gemara in Kidushin 70b, "כל הפוסל... במומו פוסל." Anyone who finds fault with others, does so with his own faults. You also asked about the reason for the fact that Western Society in general has gone to the worst extreme in the area of gilui arayos. One possible reason I can think of is that now is the time of Ikv'sa D'Meshicha, the birth pangs of Moshiach and the beginning of the geulah. I've just started learning an amazing sefer called Kol Hator (I recently posted a link to the text of the sefer) by one of the Talmidim of the Gra. He writes that the Gra taught that this time of Ischalta D'Geula, the beginning of the redemption. It is the time of Moshiach ben Yosef. (More info here) We know that Yosef's primary mida was midas Yesod, which is identified with a high level of purity in the area of shmiras habris. It could be that in today's day and age, when the light of Moshiach ben Yosef is so strong, the majority culture also receives much of this light but does not channel it in the proper direction. Thus, among the majority of people, the Yesod is expressed as Yesod Nefula, the fallen form of that mida. Perhaps that is one reason why the area of shmiras habris is so weak in this generation. Much of todays culture has grown very lax about the idea of purity (my humble opinion). Music, TV, movies are all huge influences on the younger generation, giving them ideas they probably NEVER would have thought up. 1) The main Yetzer Harah is in Arayos. 2) The whole reason a person comes to this world is to be Misakein the Bris Kodesh. 3) Who is a Tzaddik? One who is Shomer the Bris Kodesh. In my opinion, many deride the Breslover approach because the more you focus on not thinking about a pink elephant, the more you think about it. The Rambam's aitza in Isurei Bi'ah 21:24 is the absolute best way to handle the area of tayva. The more Torah you learn and the more you are 'into it' with passion, the less you'll think about zenus. It's the anti-Bresolve appraich- it replaces the tayva to a good extent without obessessing on getting out of the tayva which can cause more tayva. Many Baalei mussar, look in Alei Shur, Volume 1, page 40, for one source, say this type of yesod, based on the Rambam. R' Tzodok HaKohen writes that the the generation that will get to see Moshiach are a gilgul of the Dor HaMabul. They will have the same severe test in the area of Shemiras Habris. By correcting the sin of the Dor HaMabul in Shemiras Habris they will merit the redemption. Rabbi Nachman didn't advocate dwelling on the issue in an unbalanced way. Actually, one of the major pieces of advice he gave was that the mind is only capable of thinking one thought at a time, and therefore a person just needs to take control of their thoughts- away from troublesome things. Also, the concept of "tikkun haBris" in Likutei Moharan is quite broad, and is a much "bigger" concept than just the issue of arayos, although that is the biggest. There are many levels of tikun haBris, and many things are connected to it beyond just the issue of overcoming a yetzer for arayos. To respond to Anonymous, the issue is very important in Breslov though, but I think the way you characterize the approach is based on a superficial understanding of the sources. ASJ: It need not have anything to do with the personal fault of the critic. Other great Chassidishe Rebbes chose davka not focus on tikkun for shmiras habris, and they are not suspect of כל הפוסל במומו פוסל, chas vesholom. There are different ways of serving Hashem. It goes without saying that everyone considers chilul habris a terrible aveira; the question is only how best to deal with it. See here for an essay on the topic from a Chabad perspective.